When playing poker online strategy is everything. Since you cannot read your opponents’ faces or body language, you need to rely upon your strategic mastery to pull you through. The first, and most important thing to learn, is what hand beats what. This is the best single card from the player’s 5 cards. The face cards beating all the numbers, in ascending order of Jack, Queen, King and Ace. These are two cards of the same value, and different suits. For example, two Tens. This is a pair of pairs, two sets of two matching cards. For example, two Jacks and two Threes. This consists of three cards of the same value, and different suits. For example, three Aces. This consists of any 5 cards that form a direct sequence, across any combination of suits. For example an Eight, a Nine, a Ten, a Jack, a Queen and a King. This consists of any 5 cards that all share a suit. For example the Two, Eight, Jack, Queen and Ace of Diamonds. This consists of a Pair combined with Three of a Kind. For example two Kings and three Fives. This consists of all 4 cards that have the same value, from all 4 suits. For example 4 Aces. This consists of 5 cards from the same suit that also form a direct sequence. For example the Seven, Eight, Nine, Ten and Jack of Spades. This is the strongest hand in poker. It consists of a straight flush that begins on a Ten, and ends on an Ace. For example, the Ten, Jack, Queen, King and Ace of Hearts. 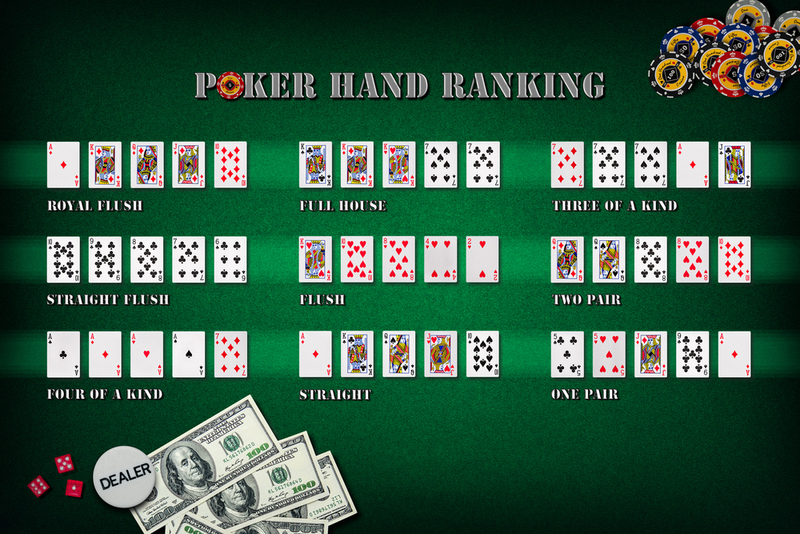 In the event that the highest ranked hands are tied, then the highest cards are the winner. For example a pair of Kings beats a pair of Queens. In the event that the hands have the same rank and value, for example two players both having a Pair of Jacks as the strongest hands, then the next highest card is the tie-breaker. If the hands are of completely equal strength, then the pot is divided evenly. The strength of hands are based on the poker hand probability. That is to say, the stronger a hand is, the less likely it is to occur. As such if a player is holding 4 cards of a Straight Flush, it would be unlikely that their next card is going to be the final card they need. It is much more likely that a player will be able to form something like a Pair, or Three of a Kind. The key in playing poker is to understand the poker hand probability of everyone at the table. Not just what you need, and how likely you are to get it, but what the other players are likely to need, and how likely they are to receive it. Some of their cards are always going to be hidden, but information can be inferred. Focus on what is known for sure, ad try to take into consideration what could be. Sometimes people will get lucky, and get the perfect card to form that Four of a Kind. In the long run though, probability will work itself out. Consistent play will always win in the end.